Last week David Tracy and I drove 3,500 miles from Michigan to Moab and back, including two passes over the Rocky Mountains and a little off-roading. It’d have been a fun road trip in a normal truck. But we didn’t do it in a normal truck. We did it in an $800 1986 Jeep Grand Wagoneer that we resuscitated after 12 years of neglect. If you’ve been following #ProjectRedwood here on Jalopnik, or on Instagram or Twitter you’ve seen that the rusty Waggy made the massive trip with an almost unbelievably low count of disasters. Sure, a coolant hose popped and almost left us stranded on the side of I-70, but we made it! Oh, and low-range had to be activated manually by wrenching on the transfer case and we had to re-install the front driveshaft every time we wanted four-wheel drive. This was my first marathon to Moab, but it was Tracy’s third time making a pilgrimage there in an impractically cheap Jeep, going from his house near Detroit to the annual Easter Jeep Safari off-road festival. In 2016, he took a catastrophically rusted Cherokee XJ. Last year he did it in a ’48 Willys CJ-2A with the help of a Ford Raptor. This time, he managed to find an example of one of today’s most coveted collector trucks, a Jeep Grand Wagoneer, in awful shape for short money. 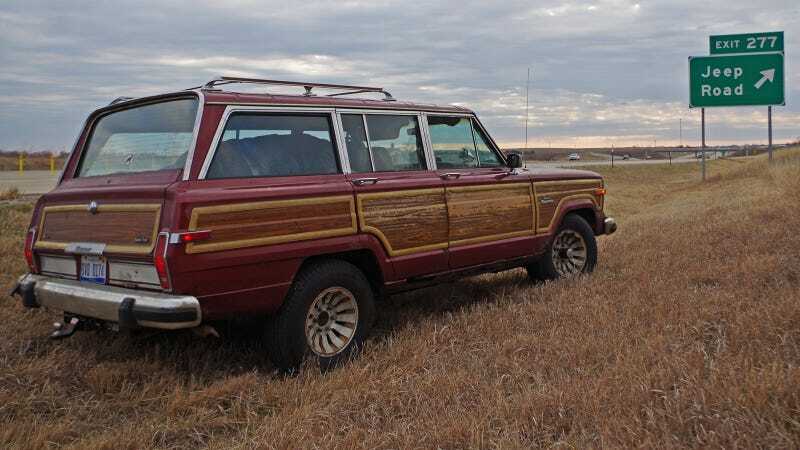 The 1986 Grand Wagoneer that Tracy scored for $800 and named “Project Redwood” (I preferred “Saggy Waggy”) was not running when he picked it up. But after rebuilding the carburetor, that iron AMC 360 V8 was healthfully purring like it was brand new. I’ll let Tracy write a more complete post on the details of what mechanical work went into the “restoration,” as it was both comprehensive and not exactly the most straightforward process. I’ll try to sum it up to be short. He topped up the Jeep’s fluids, adjusted the 727 three-speed automatic transmission’s bands, installed an aftermarket transmission cooler, replaced the water pump, tidied up the electrical system, threw on new tires and went through the brakes. He also replaced all the Wagoneer’s steering components. This meant ball joints, tie rod ends and other little things up front that can break and cause a pretty scary slowdown. Initially, he dreamt of towing his ’48 Willys on a U-Haul trailer behind Saggy Waggy, but I veto’d that because I’m a wimp. Towing would’ve effectively doubled the amount of weight we’d be taxing the Wagoneer’s brakes and engine. Getting the Grand Wag halfway across the country and back was going to be a challenge; making it pull another 4,500 pounds just seemed like a guarantee for failure. We took the Wagoneer without the trailer, but we made it. We freaking made it. And if you were to ask how, here were my biggest takeaways after effectively living in a janky old Jeep for seven days. Any time you drive an old car with an unknown history, you’re running some degree of risk. That’s what makes it interesting! But the best way to maximize your luck is by making sure that critical components like steering and braking are fully functional before you set out. Making absolutely sure. That way, if something else breaks, you’re at least likely to be able to bring your vehicle to a stop somewhat safely. Tracy’s dedication to making the Wagoneer safe is actually why we left two days later than we planned to. A lot of this trip was about “winging it,” but we weren’t about to set off without 100 percent confidence in the braking system. Troubleshooting a leaky caliper connection and janky rear brake drums, which took a whole lot more time than it was supposed to, and we finally were able to set off on Saturday morning after planning to leave no later than Thursday. With 3,500 miles to cover in seven days and a cruising speed of about 60 mph, we had to put in a lot of seat time. In fact, we drove through the night twice, pulling over for naps and hot-bunking the passenger seat. But in the best case, you’ve got two sets of eyes and ears keeping tabs on an old car’s gauges and sounds to maximize the odds of catching a problem before it escalates. If you want to be real fancy, you could run with a support vehicle. But that adds a whole lot to your gas bill and if you’ve got the budget for that, you might not need to be wasting your time with a terrible beater in the first place. When you’re on a long haul, I recommend listening to your body. Eat, pee and nap when you need to. Or ideally, right before you need to. That way you’re less likely to be overcome with discomfort and get distracted. Anyone who’s spent a lot of time in work boots will know the glorious feeling of rejuvenation that comes with a fresh pair of socks. If you can’t get a shower, this is the next best thing. Every time I’ve driven an old car a long distance, I’ve had heaps of tools onboard. But I always find that the little knife/plier on my belt gets whipped out the most. The thing was just perfect for cutting hose, and hoses tend to be a major failure point on an old car. My Gerber blade effectively adjusted a coolant line and a transmission line well enough to get us to the next auto parts shop. Driving a crappy car a long way means you’re almost invariably going to be enacting roadside repairs. And that means you’re probably not going to be able to get clean when you’re done. Having disposable work gloves and some quality cleaner like Gojo (plus rags or paper towels) makes it significantly less nasty when you put your mitts back on your steering wheel and into the bag of beef jerky, or when you roll into a town trying to look like not-a-criminal. Gojo 957 Natural Orange Pumice Hand Cleaner - 14 oz. If Tracy hadn’t put an extra transmission cooler and temperature gauge onto his Wagoneer, who knows if that thing would have survived climbing the Rockies twice. He knew to look for weak points in your machine and he got ahead of them. You should do the same. At the very least, triple check the condition of your fluid hoses. If a hose does break—as it did to us—and you’ve at least got some tape to fix it for a short ride to safety, you’re going to need to replenish whatever was spilled. Carrying coolant, oil and transmission fluid is a good idea. Don’t forget to keep them sealed in a plastic bag in case something cracks. Remember what I said about gloves and Gojo? Yeah, that’s only going to go so far. Nursing a geriatric automobile a long distance is going to mean rolling under it in suboptimal conditions, dealing with mud coming up through cracks in the floorboards, and god knows what else. The sooner you accept the fact that everything will be dirty always, the less stressed out you’ll be. Tracy and I come from different schools of thought on how to load a car. I like to sort things by size and weight and relevance. He favors hucking anything and everything so that it’s crammed in as quickly as possible. The problem with David’s strategy is that when he asked me for certain tools, I had no clue where to even start looking. That eats into your day and your patience. A little deliberate loading early on goes a long way when you’re trying to find things later. The highway speed limit might’ve only been 55 mph not too long ago, but it feels pretty freaking slow today. Especially when you’re trying to crush thousands of miles in a relatively short amount of time. But minimizing the stress of speed on components and passengers is the only way to keep a jalopy healthy when you’re driving for the long haul. Slow, steady progress is far more comfortable and usually faster than a few sprints between breakdowns. This is something that typically really, truly dawns on you after you break down when you’d been cruising at full speed for a couple hours wearing your car down, so keep it in mind. Our ride out to Moab was really only punctuated with one significant incident–our coolant vaporizing through a hose breach near the heater core. The ride back was, mechanically, even easier. Still, it took us nearly 10 hours to get from Moab, Utah to Denver, Colorado thanks to severely nasty weather and the low speeds it forced upon us over the Vail Pass. Despite seeing highway warning signs illuminated with the fact that I-70, the main corridor to Denver, was closed, we pressed on eastward and sure enough the state’s DOT opened the pass just as we were refueling on the west side of it. David re-installed the front driveshaft to activate four-wheel drive at a Sinclair gas station, and though it only actually worked for a few miles the Grand Wagoneer plowed across the mountains slowly but steadily. From there we trucked all the way to Lincoln, Nebraska and after waking up and blogging a bit at fleabag hotel by the highway, we just hard-charged it all the way to Detroit. The last leg took us about 20 hours, despite only making a few stops to repair hoses and snarf down some gas station meals. You probably won’t be surprised to read that the last leg was the hardest. There was nothing technical about driving the straight, flat highways through Iowa, Indiana, Illinois and Michigan. But by the time we’d passed the total 2,000 mile mark both Tracy and I were deeply lost to Road Madness. Everything was hilarious, colors had smells, and it was hard to remember if we were actually making progress or stuck in a looping GIF of endless mile markers whizzing by. “Your fiancée is going to remember you as two people,” Tracy assured me as we rolled into his town of Troy, cackling like lunatics. “Pre-Moab Andrew and Post-Moab Andrew.” He had a point. After covering 3,500 miles in a vehicle that most people wouldn’t trust to make it around the block had given us an irrational sense of invincibility, and the fatigue had simply made us loopy. I’d say we landed our rust bucket just in time. (That is: before we got dangerously delirious and irreversibly nuts.) Now I’m excited and terrified to find out just how sketchy the Grand Wagoneer really was, when Tracy gets deeper into his restoration process and starts to poke harder at all the rust that drops out whenever you slam a door.